The primary benefit of this app for us is the better insight and much quicker and easier maintaining of our equipment lists. We would certainly recommend this app, we would highlight the improved insights and time savings that it gives. THN is a wholesale company with more than 75 years of experience in storing and delivering technical products. THN is at the forefront with the latest developments. The company has set up an entirely new IT infrastructure in 2018. THN actively uses Atlassian Confluence for team collaboration. 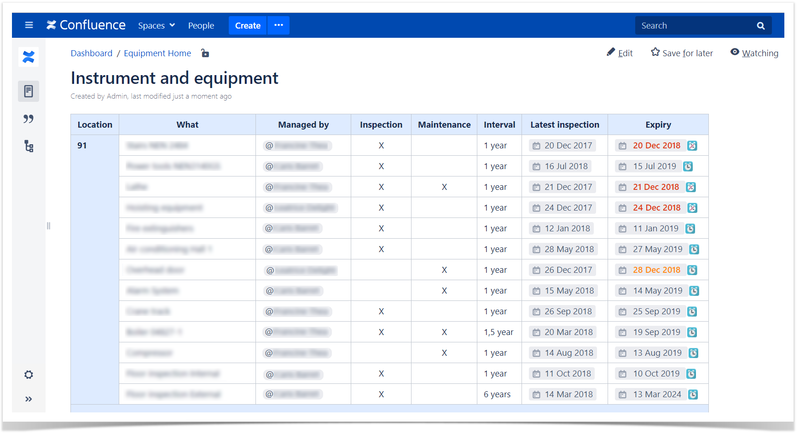 Confluence helps them bring equipment lists and all information about maintenance of measuring instrument and assets into one place. 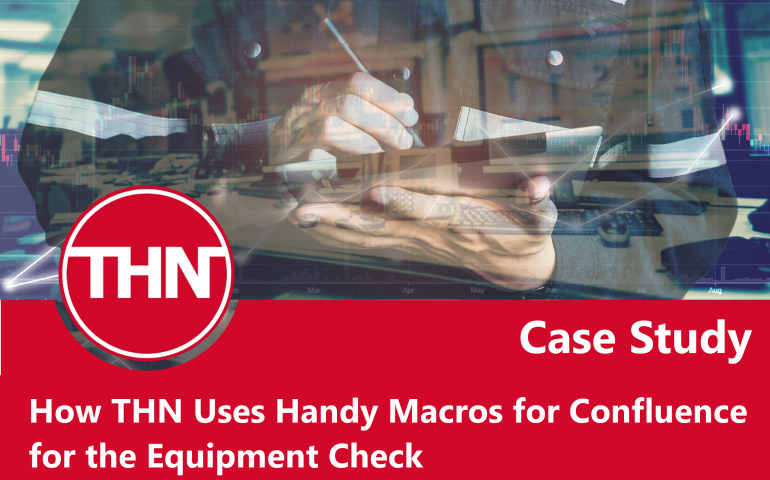 When the company purchases a new measuring instrument, a facilities manager inspects it and adds it to the list of measuring instrument and equipment. Then he enters data in all of the following relevant fields: internal code, brand, model, inspection date, inspection interval, and expiry date. When some of the items has reached its expiry date, the facilities manager inspects and tests the item. If he approves the equipment, he updates the information about inspection and expiration dates in the list. THN maintains at least 5 lists of measuring instrument and equipment with more than 30 entries in each list. 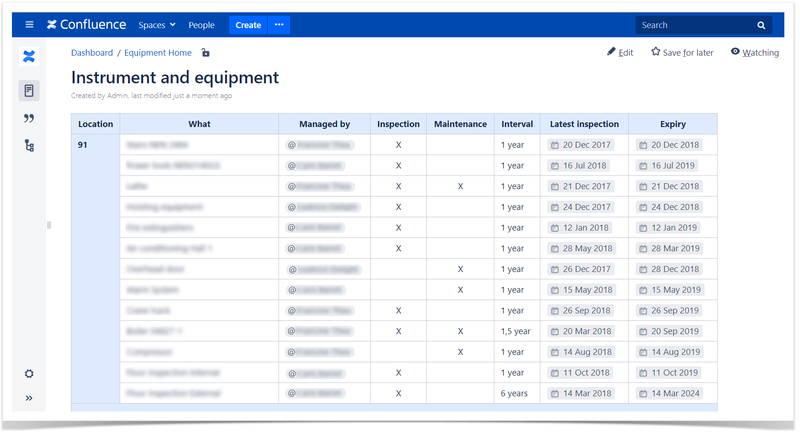 Although Confluence helps to collaborate effectively, the maintenance of these lists was the most time-consuming task for all users. The users had no opportunity to highlight the expiry dates of listed equipment. They had to look through the lists regularly not to miss any inspection date. The CEO and the management team wanted to quickly access all the information about inspections. 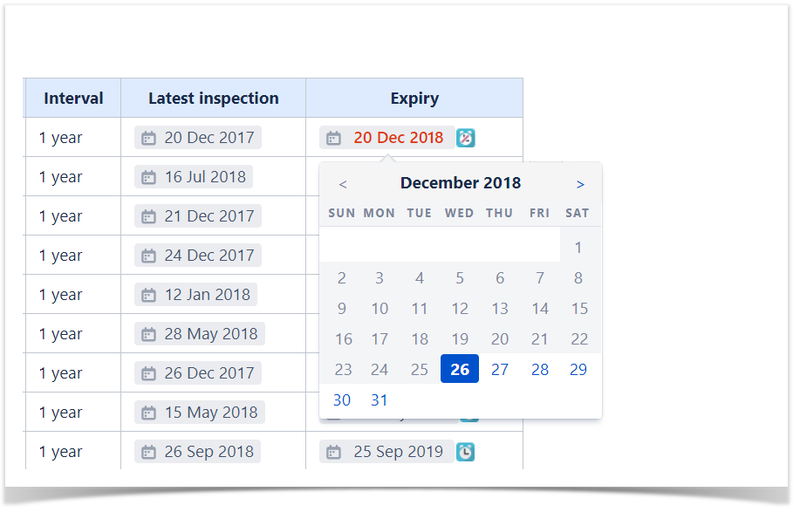 They wanted to get a quick insight into the inspections in one click to check their timely completion. When you look at this list, nothing catches your eyes. You need to look through all the dates to find the expired ones. As a workaround, the company used the user macro that displayed a status of an inspection with the help of green or red boxes depending on the due date. The user macro visualized the lists, but it was difficult to use. After the last inspection, a user had to enter a new expiry date multiple times separately. This solution required a lot of time and caused a risk to make a mistake. The Handy Macros for Confluence app includes the useful Handy Reminder macro. The macro allows a user to add a reminder to a Confluence page, set a date, time, and recipients. When equipment reaches its expiry date, the recipients get an email notification. The Handy Reminder macro also can display the set date next to the reminder icon. Dates change their color to orange in seven days before the expiry date and turn red when the due date is coming. With the help of this feature the THN team can now create easy-to-use instrument lists. Instead of using multiple date fields and the user macro all members of the team can manage only the Handy Reminder macro. Now the THN team can set a new expiry date and a reminder with a few clicks. They can do this on the fly in the page view mode. A user chooses a date with the help of the date picker and the reminder becomes enabled automatically. All members of the team have access to the lists. The expiry dates are well visualized and easy-to-change. The workflow is simple and transparent. The management team now has a bird’s-eye view of the inspection process. The Handy Reminder macro provides THN with a neat solution for their challenge with the items that have expiry dates the team needs to check and update accordingly. We are looking forward to further collaboration with THN in the future. 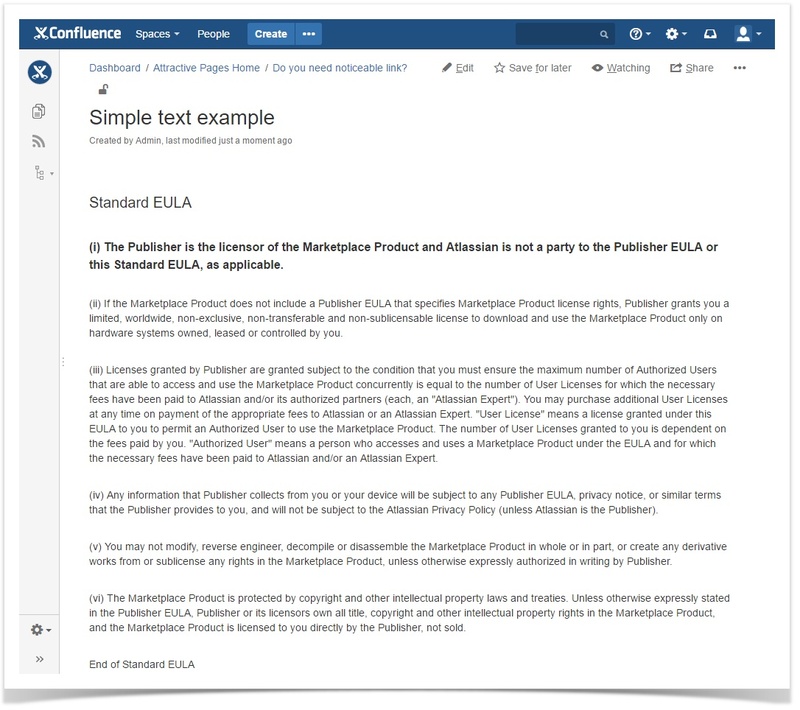 We also continue the development of the app and plan to deliver new useful features to boost the existing Confluence capabilities with the help of the Handy Macros for Confluence app.